Buakaw, why do you think you are so famous? Arguably the most globally famous Thai fighter in history, Buakaw Banchamek is used to being in the spotlight. As we sit on the floor of his gym, talking about his career, his history, his thoughts for the future, we’re interrupted by the occasional Muay Thai trainee-fan, excitedly presenting Buakaw a Banchamek t-shirt to sign. Buakaw signs each shirt mechanically. We go back to our informal interview, and his responses are polite but stiff, unenthusiastic in the way of someone who has been interviewed dozens of times before. The Muay Thai calls of other fighter-trainer pairs provide the soundtrack to our conversation. Soon our exchange is again interrupted, this time by a Chinese fighter-fan who asks Buakaw to sign his arm. Buakaw obliges, setting off a chain of arm-signing requests. Then a Banchamek Gym student with a ticket back to China for the next day asks to take a photo. Buakaw poses, uncomplaining, while the Chinese fighter and his group of compatriots take turns snapping selfies with the superstar. 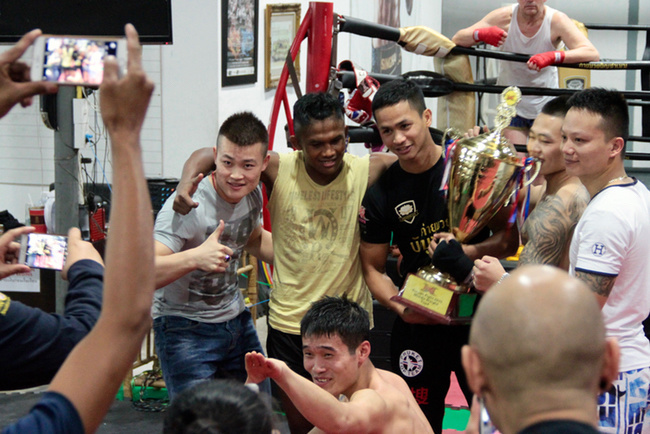 Other trainers and Thai fighters (including Superbon, who just returned from China with a huge trophy) are pulled into the shot, and then half the gym is posing together with the Chinese tourist-fighters. Buakaw returns to our conversation on the floor by the dumbbells, the Chinese fans comparing his signature on their arms in the background. I ask him if he often signs peoples’ shirts, or their bodies. All the time, he says. People even get tattoos of his signature. “It’s very special that I’m so meaningful to them,” he says quietly, coming across as sincerely modest. Buakaw and Muay Thai go hand-in-hand. Thais across all economic strata know him. He’s a premiere Thai celebrity, a symbol of their cultural sport rising to domestic and international fame. His face is plastered across billboards, TV commercials, and inflight magazine ads. Videos of him kicking down banana trees with his steel shins are a testament to human grit and athletic potential. That’s why I’m surprised when I see him in person. I barely recognize him at first, hitting pads in the ring like any other high-level Thai fighter. With his shaggy hair in a tiny, pointed ponytail above his forehead, he looks smaller, younger, friendlier, and boyishly cuter than his suave fashion ads and tough-guy publicity photos suggest. It’s my second time at the gym. I’d visited the day before, but Buakaw was conspicuously absent. Training continued as usual, coaches taking aside Thai and foreign fighters for one-on-one pad rounds while other students worked on bags or lifted weights. Just like any other gym. “He’s really nice,” said another Chinese fighter, sporting a daring, half-shaved-half-shaggy haircut. The others nodded in agreement. There were four of them total, a small sample of the swelling river of Chinese fighters making the pilgrimage to Thailand’s Muay Thai gyms. “Buakaw is extremely famous in China,” they said, each of them having come to Banchamek, and to Thailand, specifically because of the Thai superstar. Now they’re training between a few weeks to a few months for what they consider an affordable price. To put that in perspective, minimum wage in China ranges from 11 to 18.70 RMB per hour (about US $1.70 to $2.85), according to China’s Ministry of Human Resources and Social Security. Thailand’s minimum wage is 300 baht per day (about US $8.50, or RMB 55.30). As the Chinese fighters came to find out, training at Banchamek does not necessarily mean training with Buakaw. Rather, it’s more like training alongside Buakaw, in a gym given instant prestige by association. If Buakaw’s popularity is enough to attract camera-toting tourists to the original Banchamek Gym in his remote hometown in Surin, as we saw first-hand when visiting, the Banchamek Bangkok branch is downright inundated with fans, reporters, and gawkers. Management can be guarded. On our second day visiting the gym, as Buakaw practices knees with a trainer in the ring, my photographer, interpreter, and I introduce ourselves to Teerawat, the co-owner and big boss, and ask for an interview. Teerawat eyes us warily, wanting to know where it will be published. When we show him my recent interview with Tycoon Nao, famous Petchyindee gym owner and promoter, Teerawat relaxes considerably. We follow Teerawat into his office. The enclosed space is modest, enough room for a few individual desks, cabinets, and stacks of Muay Thai apparel. Much of the training space is visible through a wall of windows. 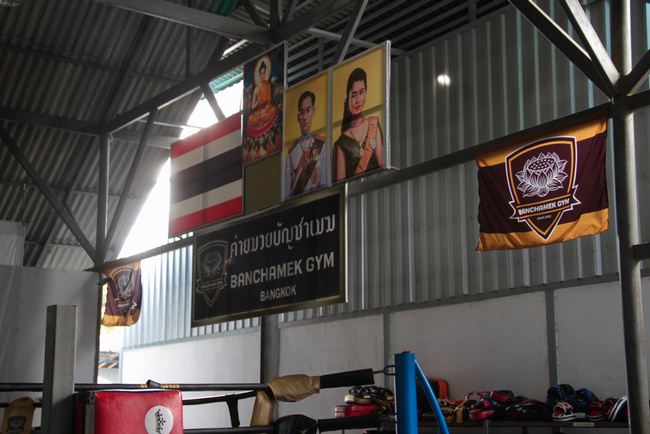 Banchamek is a young gym, only a few years old, Teerawat tells us. It’s owned jointly by him and Buakaw. Most of the foreign customers are Chinese. “And Japanese, Spanish, Russian…” Teerawat trails off with nationality-naming. We get the point. Local Thais also come and train. Thai reporters visit often. Lots of Thais want photos with Buakaw, Teerawat says. Teerawat is in the Muay Thai business primarily because of Buakaw, and Buakaw can attribute his ownership of a gym largely to Teerawat. The pair first met in 2007 in France. Teerawat, a sports scientist and physical therapist, was working with a famous Thai tennis player at the French Open. Buakaw was also in France, fighting in front of thousands of spectators. The Thai tennis player had heard of Buakaw. Teerawat hadn’t. The Thai embassy arranged a meeting, and the athlete and sports scientist found they had much to talk about. One year later, Buakaw and Teerawat met again, this time in Thailand. The owner of Por. Pramuk, Buakaw’s former gym, contacted Teerawat to help his fighters with sport-specific injury and general sport psychology. Buakaw was one of Teerawat’s patients. During increasingly candid conversations, Buakaw privately confessed his wish to retire. Teerawat responded sympathetically, told Buakaw to hang in there, as he believed sound medical attention could alleviate much of the fighter’s problems. “Don’t overtrain,” was Teerawat’s first doctorly advice. Unlike Buakaw’s gym owner and coaches, Teerawat eschewed the often unsound Muay Thai lore on treatment of injuries, instead subscribing to international-standard theories on sports science and nutrition. Under Teerawat’s care, Buakaw noticed significant improvements. Teerawat taught him where to find further information, and Buakaw soon took initiative independently to research nutrition, exercise, and rest. 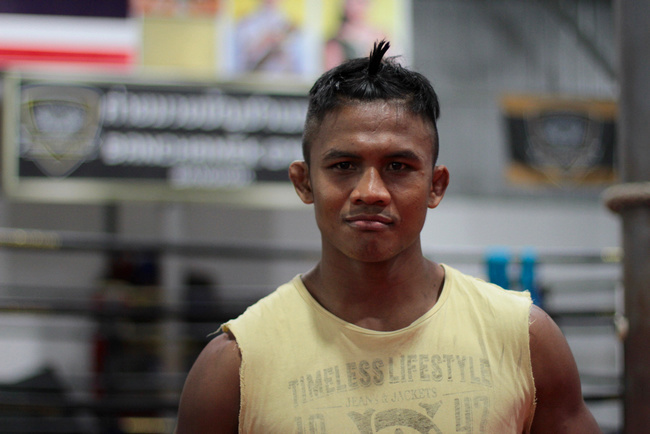 With Teerawat’s help, Buakaw recommitted to his athletic career. Soon, problems between Buakaw and his gym escalated. After more than a decade fighting under the Por. Pramuk banner, Buakaw found himself searching for ways to leave. Teerawat was one of the first people he called. In 2010, three years after their first introduction in France, Teerawat and Buakaw teamed up to open Banchamek Gym in Buakaw’s hometown in Surin Province, northeastern Thailand, with Singha Beer as a major investor. A few years later, Thai Airways joined Singha as a sponsor. 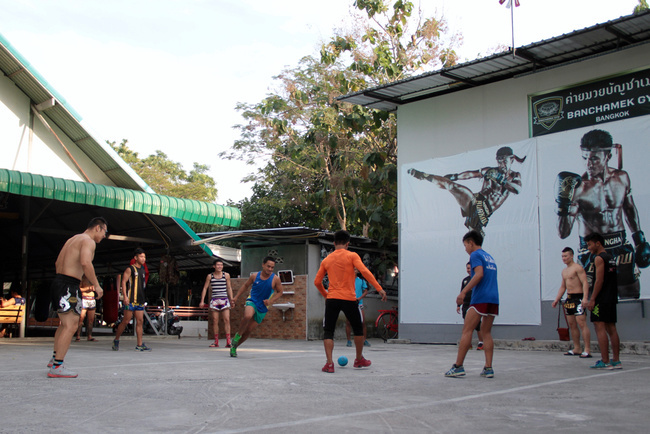 Teerawat and Buakaw opened the Bangkok branch, citing the need for Buakaw to have a training facility close to his work, much of which happens in and around the capital. Buakaw might be an Isaan boy who misses his countryside hometown, but Banchamek Bangkok has become his second home, his hub. Buakaw, what do you like about Surin, as opposed to Bangkok? In Surin, I relax, go fishing, hang out with family… I’d rather be home in Surin, but I have to be here in Bangkok for work. Banchamek Bangkok is a functioning Thai gym in its own right, with more than just one star fighter. Teerawat counts six or seven pros currently fighting for the gym. They reportedly keep 70% of their purses, a high percentage compared to most Thai gyms. Banchamek does not have any long-term sponsored foreign fighters, “but we’re interested in that,” Teerawat says. Banchamek is also interested in bringing female Thai fighters from Isaan to Bangkok, and is working on developing its Thai girls at the Surin location. “We hope to bring them here when they’re bigger,” Teerawat says. It’s a similar Muay Thai path that Buakaw himself also followed, having started in the sport at age eight in Isaan and arriving in Bangkok at age 15, already over 200 fights to his name. He goes home to his gym in Surin whenever he can, bringing the kid fighters presents and giving them motivational speeches about improving their lives through dedication, hard work, and Muay Thai. Some of the kids listen—the sponsored Thai fighters at Banchamek Bangkok are largely recruited from the community in Surin. Buakaw, what advice do you give to kids in your village? I tell them to mind their parents and elders. It’s important to me that the kids are able to take care of themselves. I want them to understand Muay Thai is a way out of poverty, but there are other ways too, like being a good person and using your brain, your talent. The villagers in Buakaw’s hometown see their local boy as a source of pride and of hope. The young kids respect him; the grannies hope for little baby Buakaws. Ambitious youngsters want to be him, seeing his fame and fortune and easy life, not seeing his exhausting training schedule or his hard-earned business acumen or the legal problems in his past or the paralyzing decisions about his future. Buakaw, kids look up to you as an idol, as someone to emulate. Who was your Muay Thai idol when you were a kid? Never had an idol growing up. I watched a lot of fighters and learned from all of them. One of the few internationally famous fighters to have started in Muay Thai and successfully crossed over into other combat sports, Buakaw reports in the interview that the last time he’s fought Muay Thai in Thailand was in April 2015. Now he fights Muay Thai and kickboxing, having signed a two-year contract with the Chinese promotion Kunlun last October. China is one of the fastest-growing markets for all things MMA, and Buakaw’s celebrity status is compounding. Buakaw, do you like China? Yes, it’s easy to travel to because it's close. Thailand and China have similar cultures and customs so it's an easy adjustment. Buakaw is now also a promoter in his own right, overseeing a new production called Super Muay Thai on Thailand’s Work Point TV. Teerawat proudly describes it as the third most popular Muay Thai TV show in Thailand, despite having aired only a handful of episodes already. This new production is, of course, in addition to Buakaw’s regular schedule of training, fighting, and publicity activities. It’s a lot of work for the 33-year-old fighter and his 38-year-old sport-scientist business partner. Buakaw if you weren't a Muay Thai fighter, what would you do? I'd be a construction worker, maybe. I could do anything. So what’s next for Buakaw and his team? I ask them separately, Teerawat in his office, overlooking the gym behind glass panels, and Buakaw, sitting on the mats by the weight bench, tired after a training session. "You want a secret?" Teerawat says in his office, almost conspiratorially. Buakaw has a different answer. But first I ask him a light question. Too busy, he says. Career takes all his time. Buakaw, what’s your least favorite thing about being famous? I embrace what comes with fame. Sometimes I wish I had more time to myself. But I understand it's part of being famous. So I ask him his plans for the future. For his career, maybe for a family. Plans for everything. Anything. Buakaw is silent for a short moment. Then he responds, claims he’s not thinking about the future. But the way he says it, with a touch of optimism, even defiance, it’s less not thinking about the future than not worrying about it. He lists his current and past occupational identities: Promoter. Soldier. Gym Owner. Fighter. “I’m too busy to think about the future,” he says. The three of us—writer, photographer, and interpreter—leave the gym with Banchamek t-shirts, gifts from Teerawat. We don’t ask Buakaw to sign them. By the time we reach the parking lot, Buakaw is surrounded by his fighter-fans, all hoping for more photo ops and arm signatures.